Featuring a powerful Cummins engine, the 26-ton National Boom Truck is designed with durability in mind. This truck features a four-section hydraulic boom that extends up to 113 ft. Additionally, a hydraulic hose reel comes mounted on the truck’s boom. 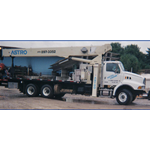 This boom truck has a maximum capacity of 26 tons and comes with out and down rear hydraulic stabilizers. Additionally, this truck comes with a 60-gallon diesel tank and 10-speed transmission.